It’s not always convenient to have regular mechanical locking systems with keys for a business. Keys can get lost, for example, and are hard to share with a bunch of employees. Most key-based locks also don’t provide a lot of protection against modern day threats. So what’s the solution, you ask? The solution is combination locks ! Jacksonville Lock And Safe is a professional locksmith service in Jacksonville, FL that can install all manner of combination locks for your business property at affordable prices. We have been providing our services to local businesses for close to a decade. You can rely on our locksmiths to install new locks for you reliable and quickly. 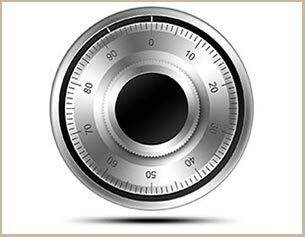 We have the most secure combination locks available in the market, sourced from the best manufacturers in business. If you want something that is very convenient to open, highly secure, but still affordably, then we have the kind of locking systems you are looking for. Mechanical: These mechanical locking systems are fully mechanical. The locking mechanism differs, but all of them use a combination system of rolling numbers. You can set them to a certain combination and open them by rolling that combination. The mechanical variety of locks is generally much cheaper than electronic ones. Electronic: Electronic locks have a keypad where you can enter the combination to get them to open. Some of them will also work with your smartphone (known as Bluetooth-enabled smart locks). Electronic locks are generally more convenient than mechanical ones, but also more expensive. With key support: What happens when you forget the combination to a lock? Some types also have key support, so that supervisors can open them with a mechanical key if there’s ever an emergency. You can get combination locks installed from our expert at your convenience round the clock. If you don’t want us to disturb the regular running of your business, we can install new locks for you in the middle of the night. We don’t charge extra for night work. Want to find the best products in the market for your business? Our locksmiths can help! We provide free consultations for business owners. We’ll help you pick out the best ones for your unique property, for your individual budget. Call us now on 904-531-3195 !